This year's Lindsey Run/Walk was a huge success with more than 1,000 people attending. The weather was perfect with a crisp autumn breeze, sunshine and blue skies. Congratulations to all of our race winners and thank you to everyone who participated and attended. 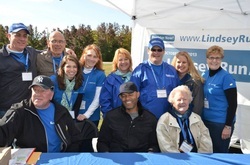 Mariano Rivera was our special guest and took pictures with fans and signed autographs. Our buffet delights were very generously donated by local restaurants and caterers. Chobani Yogurt and Pepsi again this year donated yogurt, water and Gatorade for all participants. 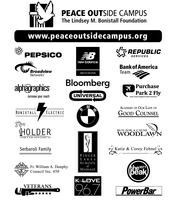 Area merchants donated to our goodie bags. Silent auction and raffle,prizes included 7 day getaways to the Caribbean, gift certificates to the YMCA, Yoga Sanctuary, restaurants, and fitness clubs. The live band, DJ and City Center Dancers kept everyone active and entertained. Finger Lakes School of Massage was on hand and provided pre and post run massages. K-LOVE, 96.7 and students from the Mount Vernon S.T.R.O.N.G program worked the water station at the mid-point of the course and cheered everyone on. The boys from Stepinac were the next group to meet the participants with loud cheers and words of encouragement to keep everyone going. The Harrison EMTs were on hand to provide aid to anyone who may have needed it. Our volunteers again this year worked hard and made the day fun, spirited and well organized. Thank you to everyone for making the 9th Annual 5K Lindsey Run/Walk successful and for helping us to grow each year. It's your support that enables us to continue our mission of advocating student safety.